"Phases Of Building A Branding Strategy"
Smartphones and social media are reshaping modern business and cultural standards for nearly a decade, so thoroughly its role has been taken in our daily lives. What’s next? That’s a question many of us have tried to answer, and the next step in the long-line of innovation so far, the ever moving faster technology–Internet of Things (IoT). The popularity of IoT has boomed across many industries as it is a key agent for mobility in their digital transformation efforts. IoT is arising as the backbone of networked devices to get connected around the world since, it is a sprawling set of technologies and use cases to communicate with the real and virtual worlds between objects, systems, and people. However, IoT represents a truly new segment to subsequently reshape your business and it is continually reinventing itself to embrace new and complex landscapes. Before we jump into its solution, it is important to take note of one of its core components – Cloud Backend. Cloud backend plays a pivotal role in facilitating lots of information from the IoT gateway to store and deliver them into actionable resources to the user interface. Cloud backend value is not solely related to the efficiency, instead gives a higher abstraction level and streamlined approach to the cloud storage services to deliver an effective mobility solution at market pace with greater agility. It is the operating system for SaaS or apps that enable you to offer a consistent and unified way to integrate data and digital services from IoT devices into a unique user experience. 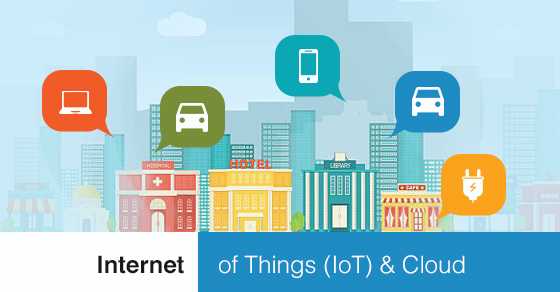 IoT and cloud are distinctively two separate technologies, but are closely associated. After your IoT project is up and running from a sensor to cloud, leads to increased interactions between devices and huge volumes of data will be generated. You need to manage those devices and handle all those information and make it work for you in robust, reliable, affordable way. Regardless of which device, network or location you need to store, process, and analyze data, especially big data in real-time, it's hard to beat the cloud. When IoT and cloud are combined, they deliver robust innovation that will continue to alter how the hardware or machinery will operate and interact with one another, and change the way how we store, handle and take information. IoT applications can transform your business by allowing you to develop smarter mobile application solutions which gather data that will influence your business strategies and facilitate productivity and growth. Labeled as “the next Industrial Revolution”, the IoT will continue to transform the way we interact, as well as speed up your development process to get market faster and allows you to focus on building the best product possible. Cloud will be the backbone of everything for your IoT solutions and scale resources to handle peaks of demand when necessary. To facilitate seamless communication, the cloud is connected to IoT gateway which manages traffic between the devices and the cloud. IoT gateway is responsible for protocol translation and other interoperability tasks. Some devices don’t contain the network stack required for connectivity. So, at times it has to maintain the connection and translation between IoT devices and the cloud, which means IoT gateway device acts as a proxy, receiving data from devices and packaging it for transmission over TCP/IP. Cloud provides protocols such as MQTT, WebSocket, cap, and AMQP to secure interface for IoT devices to connect. This efficient industry standard allows constrained devices to send real-time telemetry, as well as immediately receive messages sent from cloud to the device by using the configuration management feature. In a nutshell, the technology and technical environment are just right and the technical conditions seems ripe for this new revolution – IoT becoming universal, it’s possible to pack a lot more computing power into smaller packages, and device efficiency to reach its full potential Building IoT solutions involves solving challenges across a wide range of domains. Cloud brings device management, networking, infrastructure scaling, immense storage and analytical solution to make most of the device-generated data. IoT along with cloud provides everything together to tie for a seamless and efficient, connectivity and interaction experience just what customers want.